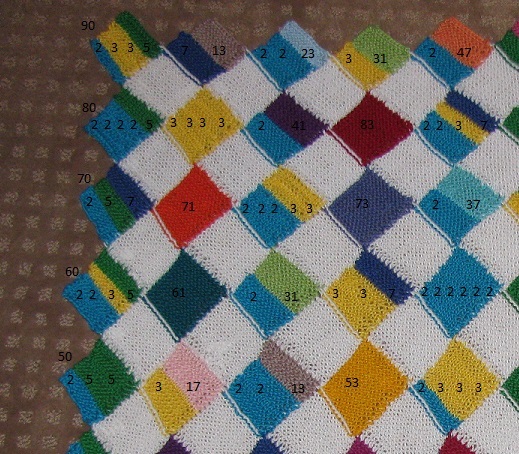 Sonderbooks » Blog Archive » The Prime Factorization Blanket! Yes! My Masterpiece is finished! What is this, you ask? 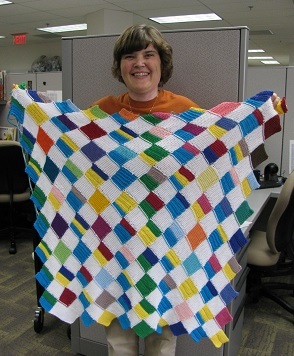 This is a Prime Factorization Blanket! With colors, it shows the prime factorization of all the integers from 1 to 99. Here’s how it works: Every prime number gets a color. The numbers start in the lower left corner. I left a space for 0. 1 is the background color, white. Then the next color is 2, a prime, so it gets its own color, blue. 3 is prime, and gets its own color, yellow. 5 is prime, and gets a new color, green. 6 = 2 x 3, so that square is part blue and part yellow. And so on. I’ve got 0 through 9 on the first row, 10 through 19 in the next row, then 20 through 29, and so on through the top row, which is 90 through 99. I put in the factors for each color. (After a few colors, I stopped putting in the “x” symbol for times.) I put a reference number on the left side so you can easily see which row. This set has 1 through 4, 10 through 14, 20 through 24, 30 through 34, and 40 through 44. This picture shows 5 through 9, 15 through 19, 25 through 29, 35 through 39, and 45 through 49. For example, see if you can spot 48, which has a prime factorization of 2 x 2 x 2 x 2 x 3. Or look at 38, right below it, which equals 2 x 19. By the way, this blanket is for my little niece, the daughter of my brother, who is, if it’s possible, even more of a math geek than me. On the 17th of December, my sister-in-law had an ultrasound, and we learned that the baby would be a girl, so I chose shades of pink for the next primes that came up, 17 and 19! And this, of course, covers 55-59, 65-69, 75-79, 85-89, and 95-99. I’m so happy to finish it! The yarn is the same as what I used for my Prime Factorization Sweater, Cotton Classic. This yarn has enough colors (most important qualification), and it’s wonderfully soft — perfect for a baby blanket. I used a lot of leftover colors from the sweater, in fact. The only really hard part? Giving it away! But I got the *idea* because my brother’s wife was having a baby, so this seems only fair to send it to the baby, as promised. Unfortunately, she lives on the other side of the country — so the one stipulation is they must take *lots* of pictures of her with it! 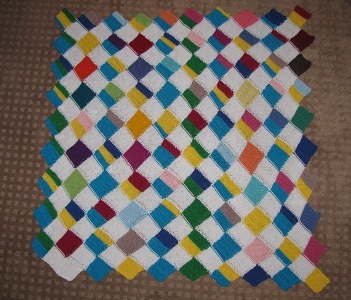 In fact, I thought of a way to console myself for giving away the blanket. 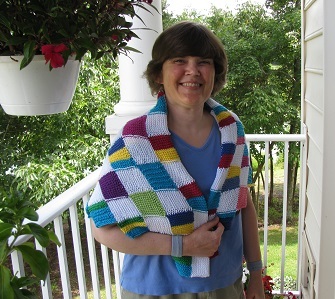 My next project will be a Pascal’s Triangle Shawl! I tested out, and the shape will work great! 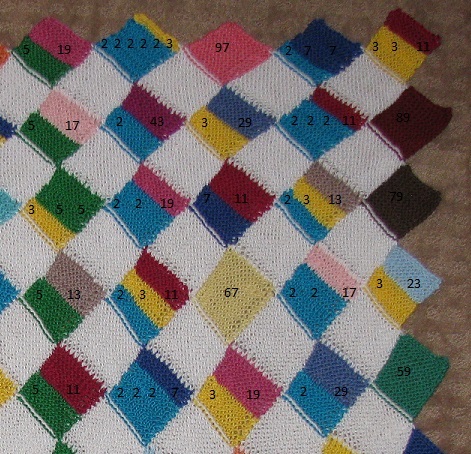 I loved doing the entrelac squares for the blanket — it was much much easier than the intarsia I used on the Prime Factorization Sweater. And it will be easy-peasy to make a triangle instead of a square. I’ll use factors and do Pascal’s Triangle…. More on this to come, you can be sure! 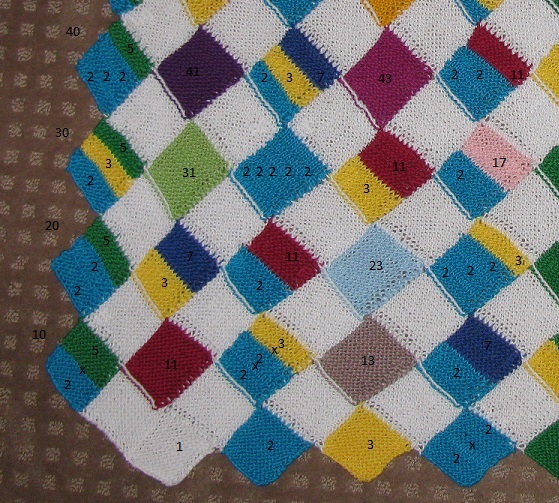 My posts on Mathematical Knitting and related topics are now gathered at Sonderknitting. Oh, and don’t forget! If you want your own prime factorization t-shirt or tote bag, you can find them at my Cafepress shop. 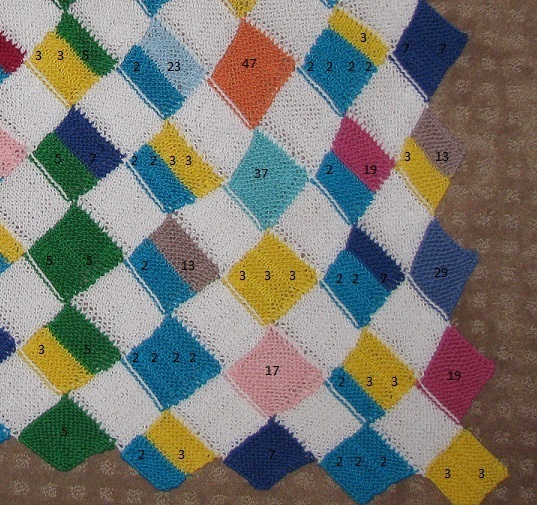 This entry was posted on Wednesday, August 21st, 2013 at 10:15 pm and is filed under Knitting, Mathematical, Prime Factorization. You can follow any responses to this entry through the RSS 2.0 feed. You can leave a response, or trackback from your own site.